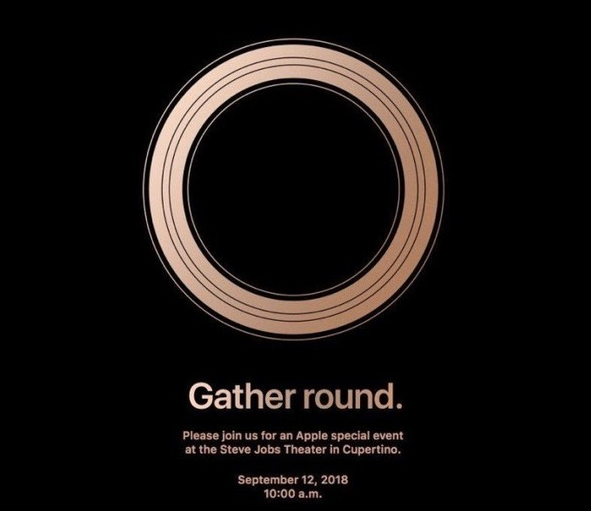 You won't have to wait much longer for the next iPhones: Apple has sent out invites for an event on Sept. 12, once again at Apple's new Steve Jobs Theater at its campus in Cupertino, California. The company, as usual, didn't specify what it will announce, but it tends to show off its newest iPhones in September. This time around, reports suggest it could introduce three new iPhones, as well as new fourth-generation Apple Watch smartwatches and new iPad Pro models. Since the invite was released, 9to5mac is reporting that at least two of the new phones will use the iPhone XS moniker (that's "ten S," presumably), and a leaked photo the site says is the revised Apple Watch 4 design. And plenty of folks are already deconstructing -- and poking fun at -- the invitation's "gather round" slogan and design. Some believe the bigger hint is the color, as the ring itself is a design Apple uses to represent its Apple Park campus. Apple has been on a tear over the past few years. The company's iPhone is one of the best-selling devices in the world, and Apple's fiscal fourth-quarter revenue projections indicate it's optimistic about the phones expected in September. At the same time, the company has been expanding into new markets like wearables, and revenue from its software and services, like Apple Music and the App Store, has been soaring. Last year's new top-end iPhone, the iPhone X, was the device's first major redesign in three years. Apple ditched the TouchID button in favor of Face ID technology and touted the device as the "future of mobile." Since it hit stores Nov. 3, the iPhone X has been Apple's best-selling device. That's even though it's the most expensive phone Apple's ever sold. The 5.8-inch device starts at $999 in the US, $300 more than the 4.7-inch iPhone 8 and $200 more than the 5.5-inch iPhone 8 Plus. Among Apple's expected trio of new iPhones in September is a possible model that's considerably larger than the iPhone X and another that's significantly less expensive. Along with those changes, Apple may incorporate new build materials and colors, increase the processing speeds, boost the screen resolution and make tweaks to extend battery life. It's also expected to update its Apple Watch with a bigger screen and introduce new iPad Pro tablets.